Every form of exercise carries some risk of injury. 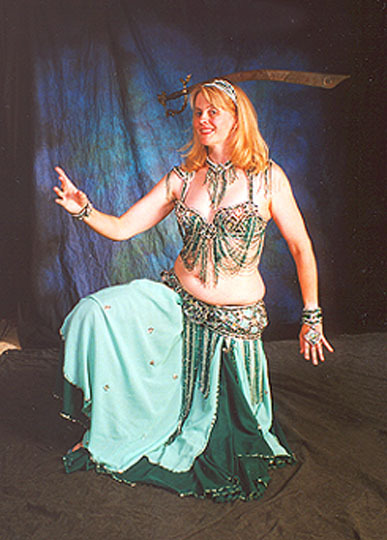 Belly dance is kinder to the body than many other dance forms, but it too presents some risk. Here are some guidelines to help you avoid injury as you explore this dance form. If you have any questions about the advice here, work with a personal trainer to give you guidance. Maybe you're doing it wrong, and your teacher can correct your technique. Maybe you're doing the move correctly, but your muscles lack the strength to execute it properly at this time. Or maybe your particular body is simply not able to do this move due to previous injury, surgery, or just plain structure. In any event, if you feel pain, especially deep joint pain, stop immediately and find out why. No dance move is important enough to risk injury! Most people understand that poor posture can look bad, so it's no surprise when a dance teacher corrects rounded shoulders and slumped stances. But there's another reason for using good posture — in some cases, bad posture can cause injury! Many women, in particular, are accustomed to standing with their rears protruding in the back. That's because a woman in high heels needs to push her buttocks to the back just to keep her balance. The problem is that when she's not in high heels, a dancer still adjusts her body into the position she is accustomed to. As a result, when flat-footed she still tries to push her buttocks behind her, which leads to a dangerous arch in the lower back. If you try to do hip accents and shimmies with your lower back excessively arched and your bottom thrust behind you, you risk damage to your sciatic nerve. A damanged sciatic nerve can lead to a lifetime of lower back pain. Feet. Stand flat-footed with feet a small distance (about shoulder width) apart. Check the weight placement on your feet — each foot should feel as though the entire width of the foot is helping carry your weight. If you feel your weight is mostly on the insider of the foot or the outside, adjust to use the full width. This is important because allowing your foot to roll either in or out can place damaging stress on your knees, hips, back, and ankles, leading to injury. Feet should point straight forward. If your doctor has told you that you have a natural turnout and should not do a feet-straight-forward stance, it's okay to follow your doctor's advice, and make sure you know your dance teacher is aware of it. Do not try to use ballet-style turnout because it locks the hips. Knees. Gently relax the knees, so there is some bounce to them. Do not use a continuous bent-knees posture throughout your dance! It's acceptable to momentarily use a bent-knee posture when doing a move such as a level change that needs it, but don't use it as your standard default dance posture for your entire dance. Pelvis Angle. Rotate the pelvis so that the triangle formed by the two points on the front of the pelvis and pubic bone points directly down to the ground. If you find it hard to visualize this (I do), a simpler description that I use when I teach my classes is that I tell my students to think about their tailbones being heavy, very heavy. As you imagine your tailbone being heavy, you'll feel the front of the pelvis rise a little and your abdominal muscles lightly activate - not grip, just lightly engage. This posture is the most important consideration for preventing lower back injury! Chest. Pretend the breastbone (sternum) is attached to a puppet string, and the puppeteer is lifting directly up. This will open up the lower abdomen. Chin Up. Many dance students unconsciously adopt a posture of the chin dropping forward, because they're accustomed to looking at their teacher's feet or hips. Focus on dancing with the chin up in a normal looking-forward position. Too much dropped-chin posture can place stress on the vertebrae in your neck. Shoulders. If the shoulders are drawing forward into a slump, adjust them so that a line passing through them would be straight, not an arc. To feel this in your body, raise your arms outstretched to each side and extend them as if trying to touch the wall on either side of you. Then lower the arms to your sides while the shoulders continue to expand outward. It should feel as though the shoulders are reaching for each wall, not squeezing to the back. After assuming the above posture, ask a friend or family member to check your shoulders to make sure they form a horizontal line, and check your lower back to make sure the spine through the lower back is straight, not arched. Concrete floors pose a high risk of injury. Some floors consist of linoleum or carpet laid directly on top of concrete, and these can be just as risky. Whether indoors under linoleum or out, concrete places your feet at higher risk of injury from stress fractures and shin splints. It also can lead to pain in the ankles, knees, and lower back. Concrete outdoors absorbs a great deal of heat from the sun, and can severely burn the soles of your feet. Concrete can also tear the skin on the bottom of a bare foot. Shoes can protect the foot from this risk. Even with shoes, dancing directly on raw concrete without a layer of linoleum over it can prevent the foot from pivoting freely on spins and Arabesques. This can lead to torque of the knee and possible knee injury. If you must dance outdoors on concrete, try to bring plywood, linoleum, or a rug to cover the concrete. If that's not an option, avoid using spins, Arabesques, and other pivoting-oriented moves while dancing directly on concrete. If you can't avoid dancing on a concrete floor, wear shoes with padding to protect your ankles and feet. My shoe repair shop modified a pair of Capezio Hermes sandals to attach a rubber layer to the sole to cushion the impact of my foot, then a leather layer on that to allow my feet to pivot freely on the floor. (The rubber layer is thinner in the part that passes over the arch.) 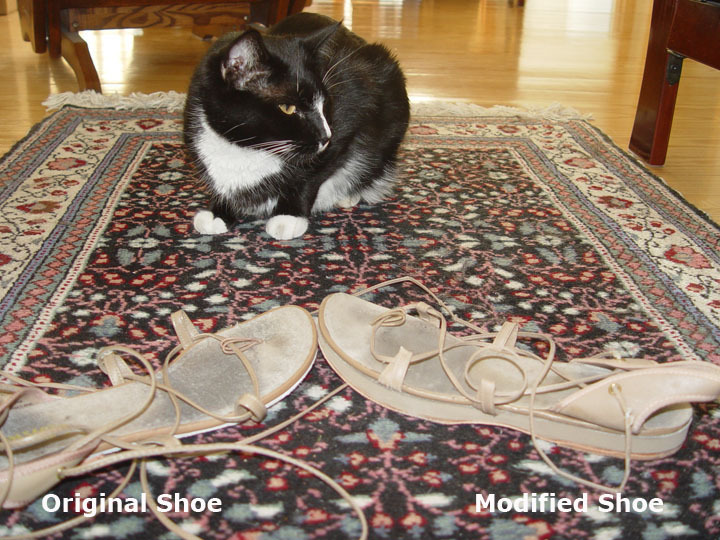 Click on the images to the right to see a closeup of the modified shoe. If you find that you always have foot, joint, or back pain after class or rehearsal, ask your teacher or troupe director about finding a different place to hold class. The safest dance floor is known as a sprung floor, and consists of a wood surface which has been elevated above the concrete by a layer of beams, with some cushioning to make it give way slightly when your feet strike it. The first time you find yourself in a hospital's emergency room as a doctor digs a glass bead from someone else's costume out of your foot, you'll understand why I'm advising you to wear shoes. 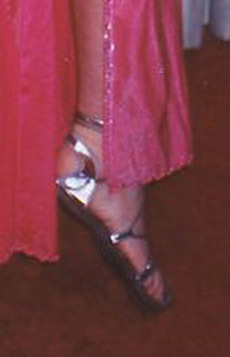 Many people believe belly dancing should be performed barefoot. Some claim it's because people historically would have done this dance barefoot in the countries where it originated. Others use dance for sacred exploration and feel the need to connect to Mother Earth. Still others simply want to avoid the limitation that rigid soles put on movement, or simply feel more comfortable dancingn barefoot. When dancing in a show that also features other dancers, you could step on beads or coins that fell off earlier dancers' costumes. Beads are often made of glass, and may be broken. I have known dancers who were unable to remove these bits of broken glass from their feet at home, and needed a trip to the emergency room. A poorly-maintained wooden floor could release splinters into your feet. Or, it may have nails sticking up which tear your skin as you step on them. Dancing outdoors on concrete or stone surfaces on a sunny day could cause severe burns on the feet that take a week or more to heal. Also problematic are wooden floors painted black. Dancing on carpet could cause friction burns on the soles of the feet. It could also prevent the foot from pivoting freely, leading to torque of the knee and possible knee injury. Grassy lawns can hide treacherous broken glass, nails, and other hazards. Indoors in a restaurant, there may be broken glass on the floor left over from when someone dropped a plate or glass. The floor may contain fungus or viruses, leading to athlete's foot, plantar warts, and other foot health conditions. See my article titled What to Wear on Your Feet for ideas on what to wear, vendor recommendations, and historical/ethnic background on footwear for belly dance. For practicing spins, half-turns (such as those used in American Tribal Style Basic Egyptian), hip twists, or Arabesques, wear dance shoes whose soles are designed to not grip the floor, such as ballet shoes, Scottish ghillies, ballroom dance shoes, or dance sandals. Choose shoes that let your feet pivot freely. Avoid dancing barefoot on any kind of surface. Here's why: if the sole of your foot encounters too much friction with the floor when you spin, then you run the risk of painfully twisting your knee joint. Shoes with soles that pivot freely are the safest footwear for your knee health. As noted above in the posture section, make sure you always use the full width of your foot to bear your weight. Do not allow your weight to roll to either the inside of the foot or the outside, because that can place intense stress on your ankles, knees, hips, and back, putting you at risk of injury. Drilling the same type of move repeatedly for a long time can lead to repetitive stress injuries. Although it's important to drill, set a timer for 10 minutes and shift to practicing a different move when the time is up. Stop earlier if something starts to hurt before the 10 minutes are up — for example, your lower back might start to hurt while you're drilling figure 8's with your hips. Playing finger cymbals too long at once can lead to repetitive stress for the wrists. Traveling steps, Saidi hopping steps, or stamping the feet in debke can cause stress fractures in the feet or shin splints, particularly when dancing barefoot. For stamping steps, stop the downward force of your foot slightly above the floor and then just tap the floor lightly with your foot - similar to the way actors pull their punches when staging fight scenes. Take care when practicing footwork-intensive dance styles such as debke, Nubian, and Khaliji. Try to stay light on the feet, and avoid grinding the feet into the floor. Visualize yourself floating on air, with your feet just barely touching the floor. Or, imagine yourself dancing on thin ice, stepping lightly to avoid falling through. 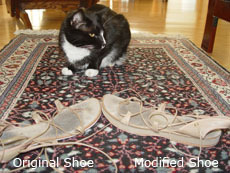 Shoes with a bit of padding in the sole can protect against this risk. Floor work looks wonderful, but certain moves can lead to knee injury. If you have any history of knee trouble, ask a doctor or physical therapist to advise you before trying any floor work moves. Many dancers bang their knees as they descend to the floor or perform floor-based movements. For example, consider the knee walk in this photo in which you start from a kneeling position, reach forward with one foot, then draw yourself forward onto that leg until its knee reaches the floor. This move can be risky if you don't take care to give your knee a gentle landing, yet some dancers bang their knees as they crawl from leg to leg. When doing floor work, consider wearing athletic kneepads under your pants to cushion your knees. (You should be wearing pantaloons anyway to prevent your floor work moves from exposing your crotch to public view.) If your pants are sheer, choose flesh-colored kneepads. One dance move that is especially dangerous for your knees is the Turkish backbend, shown in this photo to the right. Although this move is a real audience-pleaser, it places incredible stress on the knees. One time after I performed a Turkish drop, which consists of spinning and dropping abruptly into this position, I had knee pain for the next 2 months. In 2002, when I performed a Turkish drop, I landed badly and have experienced knee trouble ever since. I needed to stop doing floor work completely because my knees could no longer tolerate it, and I even had to be very cautious in yoga classes to avoid certain poses that placed stress on the knee. The best advice for safety is, "Don't do it!" Build Leg Muscle Strength. Before ever attempting this backbend, spend several weeks performing daily exercises to strengthen both the front and the back of the leg muscles. If you have access to a gym, use the leg extension and leg curl weight machines. To build muscles in the front, especially in your thighs, kneel on the floor with your torso upright. Slowly lean back just a little, with your body tracing a straight line from your knees through the top of your head. Hold this position as long as you can — you'll soon feel the pull in your thigh muscles. Build Abdominal Strength. Use sit-ups or crunches to build strength in your abdominal muscles. Work Up To It. Before you ever attempt your first backbend, perform the above exercises daily for several weeks to build strength and flexibility in your leg muscles. Use Knee Pads. When you're ready to try the backbend, either wrap your knees in an athletic bandage, or put on athletic kneepads. Your knees will thank you for the support! Don't Bang Your Knees On The Floor. Whether you descend gradually to the floor or perform a dramatic Turkish drop, avoid banging your knees on the way down. Learn to absorb the impact spread across the surface of your shins. Your neck is very delicate. An injury can lead to a lifetime of pain or partial paralysis. Treat your neck with respect. Many belly dancers like to do hair tosses, especially when performing the Khaliji women's dance known as samri or the Moroccan schikhatt. The problem is that this move can be dangerous. For one dancer I know, practicing this move actually caused a condition known as "dissection" of a neck artery, in which the inner wall detaches and bunches up, creating a partial blockage, a type of stroke. This interferes with flow of blood to the brain, and can be very serious. Forward And Back. Following the posture advice above, stand in place, arms dangling at your sides. Bring your chin down to your upper chest as far as it can go without sacrificing the shoulder position described above. Hold it in position for a few counts. Next raise your chin and tilt your head back as far as it can go. Do this in a slow, controlled fashion. Avoid abrupt movement. Repeat these forward and back positions several times. Side To Side. Check your stance to ensure your rib cage and shoulders are still in position as described above under posture. Tilt your head toward the left, as if trying to touch your left ear to your left shoulder. Be careful not to raise your shoulder to meet it! Feel the stretch in your neck on the opposite site as you hold the position for a few counts. Gently bring your head back to the upright position, then repeat the move on your right side. Do this a few times. Head Slides. Check your stance to ensure your posture is still correct. Now, looking straight forward and keeping your head upright, move your entire head horizontally to the right. If you had a pen attached to each ear, it would draw a straight horizontal line, parallel to the floor. Be careful not to tilt your head toward your shoulder, and be careful not to hunch your shoulder. Now repeat the same move to your left. Do several. Feel the stretch in your neck as you go gently from side to side. Do just a few of the above exercises first, then over time slowly build the number of repetitions as you gain strength. Whenever you start practicing hair tosses, try to avoid circular motions that involve tilting your head toward one shoulder, then toward the back, then toward the other shoulder. It's okay to circle across the front, but circling across the back is risky. That combination of tilt and rotation across the back can cause neck injury. Take it easy when you first start doing hair tosses. Do just a couple, then stop. One time I performed hair tosses in a show without having first built up the strength, and my neck hurt for over a week afterward! 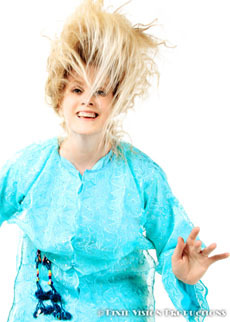 If you have practiced or performed hair tosses, pay careful attention to your overall health for the next week. In particular, watch for headaches, vomiting, neck pain, vertigo, disorientation, and loss of balance - any of these could be a symptom of dissection of the artery. If any of this happens, go to an emergency room and be prepared to tell the doctors that you may have experienced a neck injury. Another thing to watch for is pain in the neck vertebrae area - this could signal injury to the spine in this area, and if you experience it I'd advise going to see an orthopedic specialist as soon as possible. It's safe to drop your chin toward your chest when doing a head circle toward the front. However, it's not safe to let your head flop backward if continuing the roll to the back. This can injure the cervical disks in the spine, leading to possible injury. The safest thing to do is to limit the movement to a semicircle to the front, and not roll to the back at all. If you absolutely insist on including a full circle, don't let your head flop as it goes to the back. Use your neck muscles to keep the head lifted as it crosses the back, avoiding any pressure on your spine. Performing or watching other people perform can permanently damage your hearing if the people responsible for the sound system turn the music levels up too loud. Earplugs can be your friend. Check Shaun Wall's article "Audio Levels and Hearing Damage" elsewhere on this web site for advice on which earplugs work best for protecting your ears while still allowing you to hear the music. 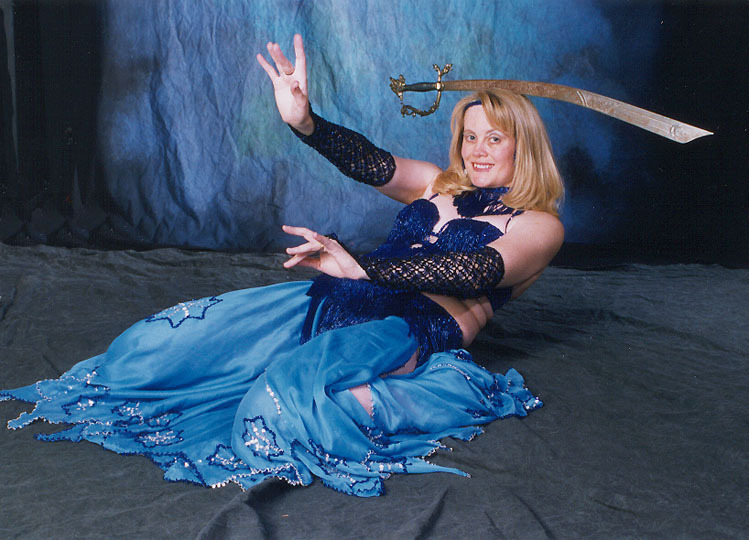 You'll know you have a well-informed, safety-minded belly dance teacher if she encourages the posture I described above, corrects your technique, offers exercises for building strength in the muscles needed to perform dance moves, and warns you of the injury risks. Teachers who encourage arched backs and fail to warn you of injury risks may be hazardous to your health. It's your body, and you have a right to keep it healthy. When your teacher corrects your technique, take her advice to heart, and don't feel embarrassed by the attention. If your teacher pressures you to do something that feels "wrong" or scares you, get another opinion. What to Wear On Your Feet. Includes a section on foot health for dancing. Dear Shira: Learning Backbends. Advice on learning how to do backbends safely. Audio Levels and Hearing Damage. By Shaun Wall. How to avoid damage to your hearing caused by too-loud music. Foot, Muscle, & Joint Health. This article focuses on caring for yourself while traveling, but its advice is also valuable for when you're at home.